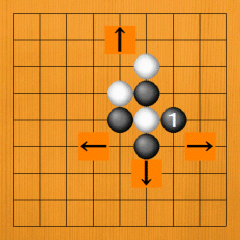 · Go is a game of enclosing territory, but in the process we can capture the opponent's stones. This is one of the fascinating features of Go. When you have just started playing go, you may become absorbed in capturing stones. · Let's look at Dia. 13. 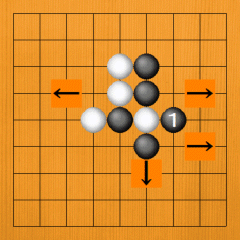 If a stone is surrounded above and below and to the left and right by enemy stones, it can't exist on the Go board. In short, it is captured. Just now, the white stone is in a perilous situation. It is surrounded by Black in three directions. 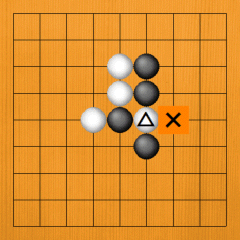 From Black's point of view, if he can play a stone on the X point, he can capture the white stone. · In short, in Dia. 14, Black can capture White by playing at 1. In an actual game, you pick up the white stone and remove it from the board. This feels good. The point where the white stone was becomes black territory, as there are black stones on every side. · In Dia. 15, there are two white stones. Even though the number has increased, Black can still capture them if he surrounds them above and below and to the left and right. If Black next plays on the X point, he captures them. · Dia. 16. 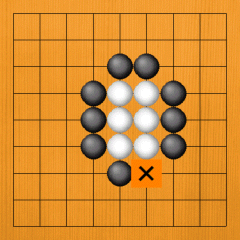 If Black plays at 1, he can capture the two white stones. Capturing two stones with one move is even more fun than capturing one. When you learn how to capture stones, you become addicted to it. · In Dia. 17, there are six white stones. If Black surrounds them in all four directions, he can capture them. 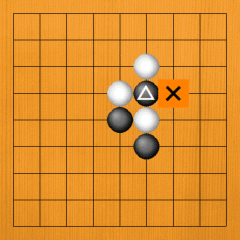 The clump of white stones is virtually surrounded by Black; only the X point is open. If Black plays there, he can capture White. · Dia. 18. 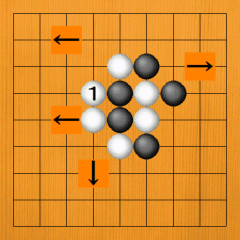 If Black plays at 1, he captures the six white stones. In a game, capturing six stones with one move is really something. 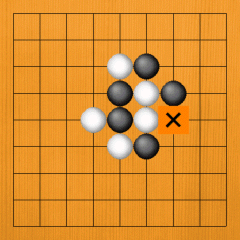 It's hard to take six stones off the board at one go, so probably you will have to take off two stones each three times. The opponent has to wait while you do this. The contrast between the general who has won a battle and the general who has lost a lot of troops is one of the delights of Go. If you experience it, you are sure to enjoy it. · In contrast, let's look at it from White's point of view. If it is his turn to play, he can escape with his stones before they are captured. If he plays at 1 in Dia. 19, Black can no longer capture him immediately. The vacant X points next to the white stones have increased to three, so Black can't capture him unless he fills in all these points. If White doesn't play at 1, he is captured with one move, yet if he plays at 1, Black has to play three moves to capture him. The situation has changed drastically. · Dia. 20. 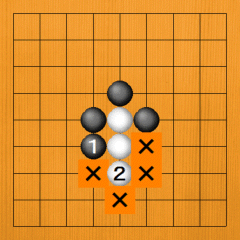 In Go, you play one move each alternately, so if Black pursues him with 1, White plays at 2. The number of X points has now increased to four. It's become even harder to capture White. He can now relax a little. No matter how hard Black chases, White slips away from him, so Black will get irritated. It's not so easy to capture stones. ·Dia. 21. Next, the moves from 1 to 4 are played. Black chases, but White easily escapes. You can't easily capture stones simply by chasing them. · (Application) Let's have a look at Dia. 22. The stones are intertwined with each other, making a complicated shape. If Black next plays on the X point, he can capture the marked white stone. It's already surrounded on three sides, so only the X point is open. 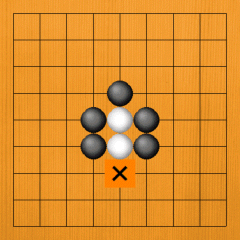 If Black plays on the X point, White will be captured. · Dia. 23. In short, if Black plays 1 here, he can capture White. Not only does it feel good to remove the opponent's stone from the board, it's actually also very effective. If you remove a white stone in this diagram, there are only two white stones remaining on the board. Black has four stones remaining, so the balance of power becomes very favourable for Black. Take a look at the whole board. Doesn't Black seem to be generating strong energy in the directions shown by the three arrows in the bottom half of the board? Somehow, it feels as if he will be able to make a lot of territory. 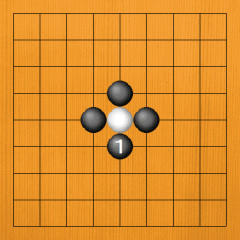 In contrast, White may be able to surround the area indicated by the arrow pointing to the top, but he has only two stones, so his position feels a little forlorn. At this stage, it's enough if you can just get the feeling that having your stones captured is not good. You will gradually come to understand it in detail. · Dia. 24. In the same position, let's assume that it's the other player's turn to move. What happens if White plays first? The marked black stone is surrounded on three sides by white stones, so its only vacant point is the X point. That means that White can capture the black stone if he plays there. · Dia. 25. 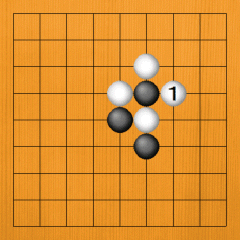 If White plays at 1, he can capture the black stone, so the question of whose turn it is makes a big difference. In an actual game, stones are often crowded together like this, so it's important to get used to it so that you can work out what's going on. · (Actual game example 1) Dia. 26 shows a position from a game. First, please think about it from Black's point of view. The marked white stone is surrounded by Black above and below and to the left. The only vacant point is the X point, so we're sure you understand the rest. · If Black plays at 1 in Dia. 27, he can capture the white stone. Black now has five stones on the board and White has only three. Black is surrounding the area to the right and at the bottom and looks likely to get a big territory. 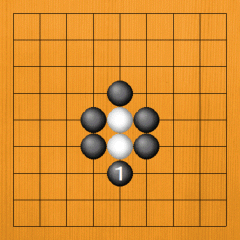 White is surrounding the area to the left, but just at glance you can see that his formation is not as strong as Black's. That shows how effective capturing a stone is. · Please look at Dia. 28. 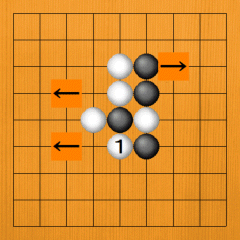 If it is White's turn to play, he can capture a black stone with 1. 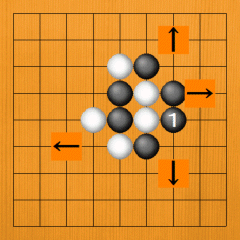 After capturing it, White is surrounding the area to the left shown by the arrows and his position looks strong. Black might be able to surround the area to the right indicated by the arrow, but his position looks quite forlorn. Having one of your stones captured has a big negative effect on you. · (Actual game example 2) Dia. 29 shows another example from a game. The question of whose turn it is to play will make a big difference. First, let's look at it from Black's point of view. The two marked white stones are almost completely surrounded by Black. Only the X point is vacant. · Can you see that if Black plays at 1 in Dia. 30, he can capture the two white stones? If he does, he will have six stones on the board, whereas White is reduced to three. Black exerts strong influence in the areas indicated by the three arrows on the left, so White will feel forlorn. Can you appreciate that the balance of power is overwhelmingly favourable for Black? · What if it's White's turn to play in Dia. 31? 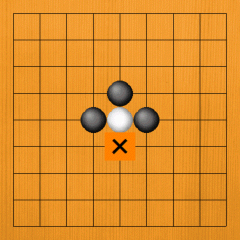 Will he flee by playing on the X point or does he have a better move elsewhere? · Playing White 1 in Dia. 32 is a good move. 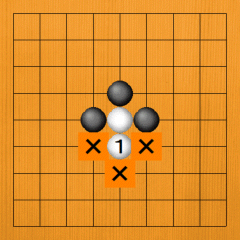 If White fills in all the vacant points of the two black stones, he can capture them. Rather than fleeing, it's better to capture enemy stones. If he captures them, White can build a big territory in the areas indicated by the arrows on the left. 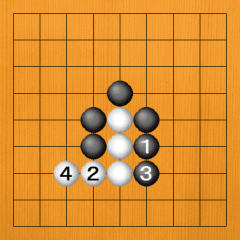 In contrast, Black's position becomes quite weak. Copyright© PANDANET Inc. All rights reserved.